Mahalo 4 Life is an Environmentally Conscience online store dedicated to providing high quality Eco-Friendly Yoga, Pilates and Fitness equipment at affordable prices. We are passionate about helping you look after your body, mind and soul and equally passionate about caring for our environment and leaving only a natural footprint. Extensive time has been spent researching and sourcing materials and products from suppliers around the world with the same ethics that fit into our high standards and values. You can rest assured that our products are non-toxic and safe to use. If we won’t use them, then we won’t sell them! Mahalo 4 Life is a highly reliable online store that places great emphasis on outstanding customer service. We are constantly looking at where and how we can improve our service to you. We want your experience with us and our website to be a happy and positive one regardless of whether you are shopping, browsing or just reading our blogs. If you have any ‘how we can improve’ suggestions please feel free to email us, your feedback is most welcome! Founded by Cathy Gibbs in 2016, Mahalo 4 Life is an Australian owned and operated business based in Perth, WA. As a former truck driver, Cathy spent 15yrs in the Northern Territory ‘trucking’ through the outback and understands the importance of packing goods correctly so they arrive at their destination safely. Cathy has always had a great love of nature and the outdoors and is often off on adventure in an unusual setting somewhere. She believes and enjoys giving back, whether through giving of her time or donating to a worthwhile cause. 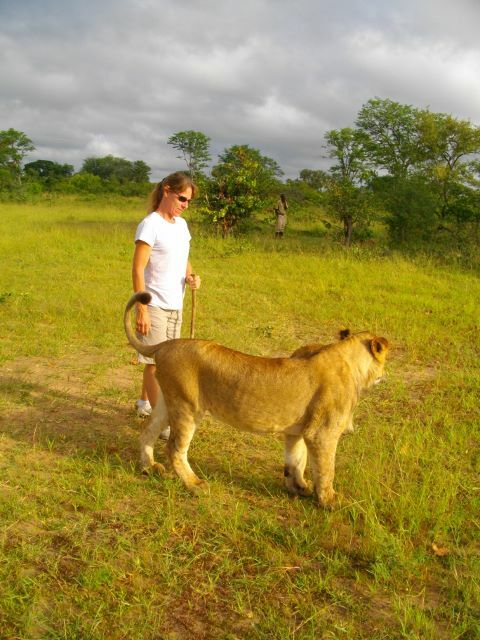 Her latest ‘paying it forward’ adventure took her to Zambia, Africa where she worked as a volunteer in a lion conservation program for 2 weeks. Our name Mahalo 4 Life was established as our way of saying ‘Thankyou For Life’ - We are Grateful for it! Our store is frequently updated with new products to ensure that you have an easy and convenient way to access a diverse range of fitness equipment to assist you in achieving your fitness goals. We are proud to say that we are now an entrusted supplier to many health professionals in the local area and we would like to take this opportunity to Thank them for their going support! We are always happy to answer any questions you may have so please feel free to get in touch via email or phone and we will do our best to answer them. If you would prefer to have us to call you back then please leave your name and number and one of the team will call you asap (always within 24hrs). Mahalo for taking the time to read about us. Have a great day!